So, after eight weeks of recuperation, I’m finally facing the dreaded return to work. I’m not really dreading it, not really. 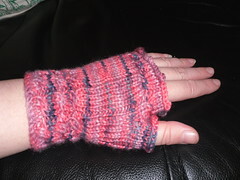 It’s just the laziness kicking in and wishing for more time sat on my backside knitting and reading and not having to do much else. There is a general level of anxiety about the early mornings, the trips to Bristol, the bit where I have to see the people for the first time, but it’s not so bad. Honestly. Convinced yet? Anyway, I thought I was going to say that this week has been a quiet one…and compared to some it has been…but not that quiet when I think about it really carefully. Last Saturday we went out for dinner with lovely Kat and Alan. We went to La Carbonara, an Italian restaurant not far from here. It was delicious. We’ve been trying to get a reservation there for a few months, as Alan and Kat recommended it strongly, but it is always fully booked. This time we reserved a month in advance and I now understand why it is so popular – the food is really good quality and cooked so well. There’s a huge range available, so much it was hard to choose! We had planned to take our nephew out for his birthday on Sunday, but that didn’t work out. We’ve bought him a present which we’ll deliver later today instead…think we’ll stick to that in future. On Tuesday we offered to look after Gethin again, so David and Sam could go to the cinema. Lovely Sam has been desperate to see the latest Harry Potter film, so we took in a very grumpy, teething baby for a few hours. Poor little boy was obviously in pain, and couldn’t decide between crying to express that pain or laughing his usual constant chuckle. Early this week there were also a couple of expensive incidents…firstly A noticed that a hubcap was missing from my car. I hadn’t realised how expensive those things are! Then, in a moment of utter stupidity (me) and carelessness (A), I left my glasses on the bed while I changed my jumper…A bounced into the room and launched himself across the bed…crunch! Luckily I bought 2 pairs at once, so I had a spare pair, but have since been to Tesco for a really cheap second pair to keep spare. I can’t see much at all without them, certainly can’t drive, so I have to have a spare pair. 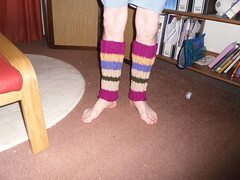 Legwarmers for Mum (she’s very happy with them), modelled by A. 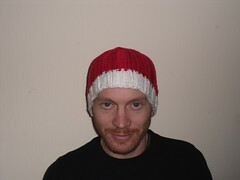 The pattern is ‘Fetching’, a Ravelry freebie. I completed the first one in a few hours yesterday, so the second shouldn’t take long to do. They will probably live in my desk drawer at work, for the days when the heating doesn’t work or isn’t enough. The colours aren’t quite as neon as they look in this photo, but they are hard to capture! 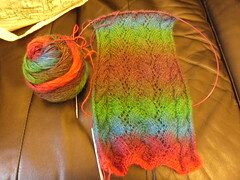 Also in progress are my alpaca mermaid socks, but they’re going very slowly. I think maybe because I’ve been focussed on the whole ‘got to use this yarn’/’got to knit this scarf’ problem. Also I haven’t been out as much this week. So this week coming…apart from the whole ‘back to work’ thing on Monday and the ‘trip to Bristol’ thing on Tuesday, there’s not a lot going on. This weekend we’ll be putting up decorations, writing cards and wrapping presents for Christmas. Next weekend is Gethin’s christening. Then just 3 working days the week after and I’m off for Christmas. This entry was posted on December 11, 2010 at 10:52 am and is filed under Baby, Food, knitting. You can follow any responses to this entry through the RSS 2.0 feed. You can leave a response, or trackback from your own site. Life surely fills in when there is not a job to go to. It is just different. I liked just having other people to talk to at a job….but I would have a hard time giving up the baby. May have to do something like that this fall.